Well, after over 20 years and 165,000 miles of wear and tear, the suspension on this ES300 was due for a replacement. There were obvious squeaking and rattling noises coming from the front end, and the suspension would bottom out and spring back up whenever the road surface changed. The worn ball-in-socket of the stabilizer bar link would make rattling noises with every road imperfection, the cracks in the rear control arm's rubber bushings would affect steering during acceleration and braking, and the loss of gas pressure in the suspension struts made you feel like you were riding in a boat. 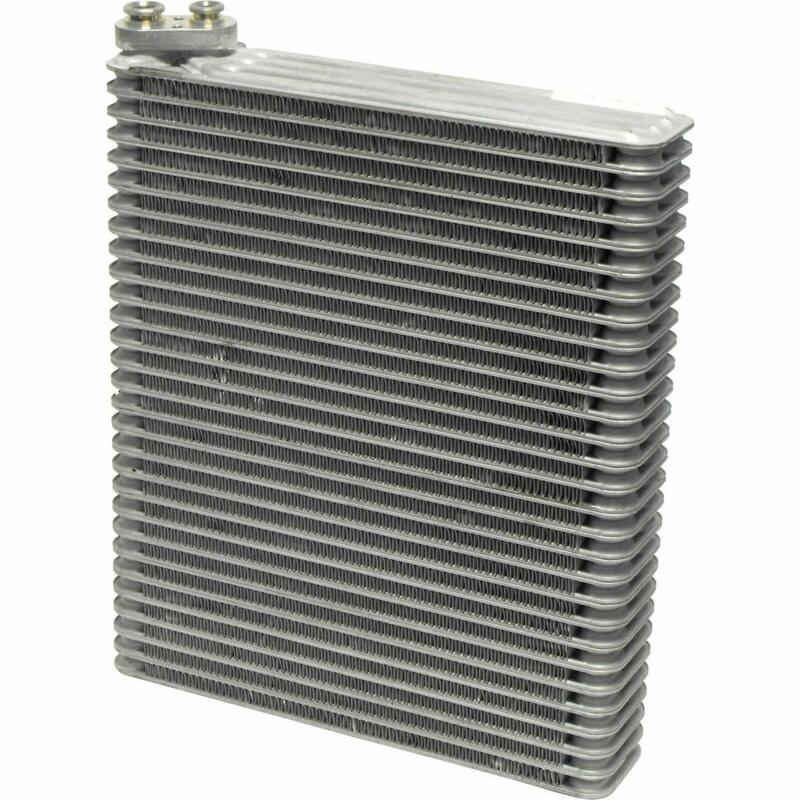 If you want to restore a like-new car ride to your old, high-mileage ES300, consider replacing the parts described in this article. The below videos will show you how to perform the replacement. 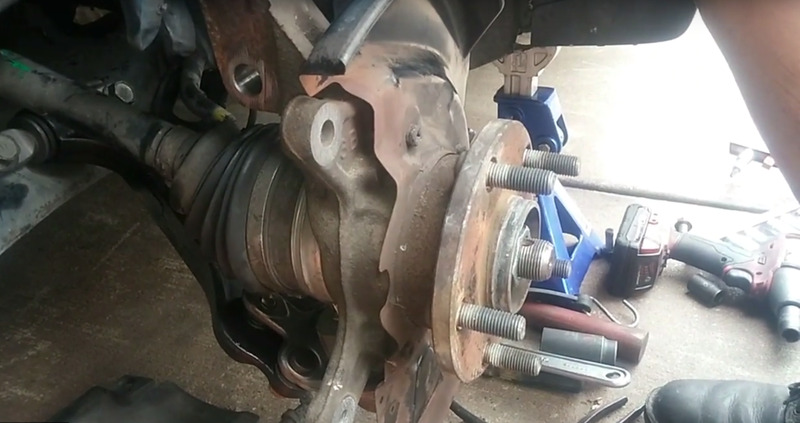 The first video begins with the brake calipers and rotors having already been removed; if you want to see how to remove the caliper and rotor, see my article and video on refinishing calipers and rotors on an ES300. Detach the sway bar link from the sway bar. You can leave the top portion of the link attached to the suspension strut. A 5 -mm hex socket used in conjunction with a 14-mm open-end or pass-through socket wrench will help you detach the link. 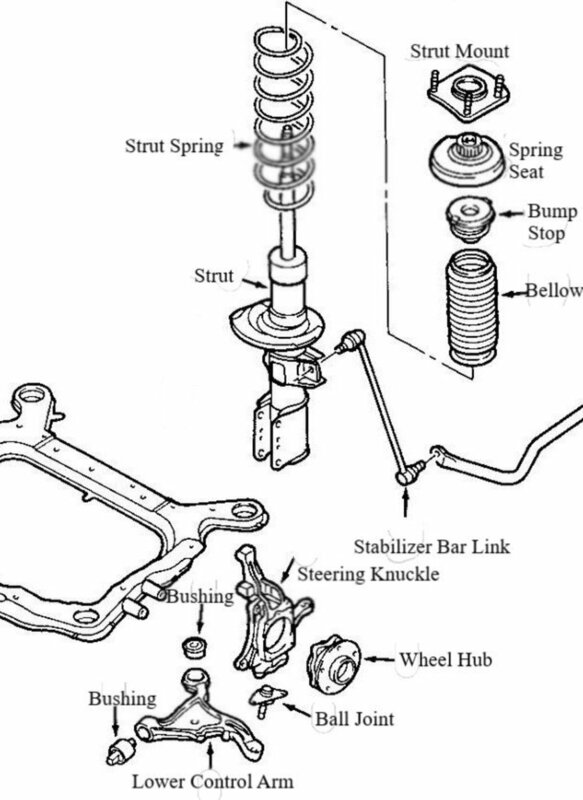 Remove the two nuts and bolts that holds the steering knuckle to the suspension strut. 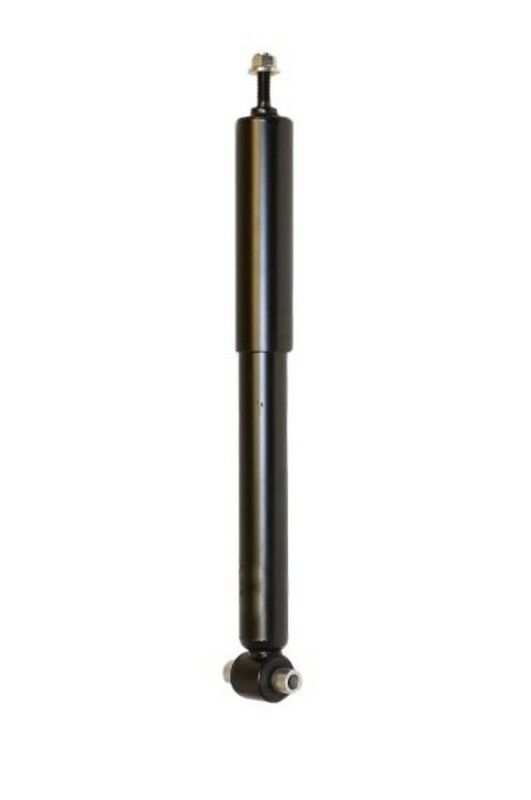 Use a pry bar to detach or wiggle the steering knuckle away from the strut. 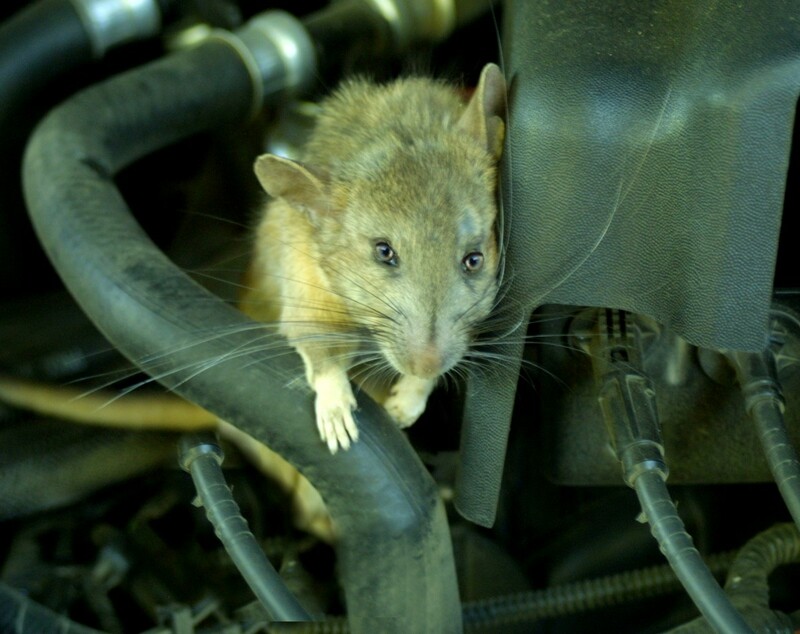 Inside the engine compartment, remove the three nuts that hold the suspension strut to the chassis' strut tower. While you remove the last nut, hold up the strut with your other hand to keep it from falling down. The video below will show you how I did it. To avoid the stabilizer / sway bar from interfering with the removal of the lower control arm, detach the sway bar link from the other side of the suspension. This will allow you to move the bar above and away from the control arm. Remove the cotter pin, cotter pin alignment washer, and axle shaft nut. The axle shaft nut can be removed with a 30 mm-socket and either a mechanical or powered impact tool. If the splines of the CV axle will not pass through the wheel hub, use a large punch with a hammer to press the shaft through the wheel hub. Disconnect the outer tie rod end from the steering knuckle. Remove the cotter pin, and tie rod end nut, and apply hammer blows where the tie rod end is fitted to the steering knuckle to vibrate it off. Pull the CV axle out of the wheel hub. You can use a screwdriver to pry off the wheel bearing dust shield from the inner portion of the steering knuckle. Remove the ball joint cotter pin and nut. 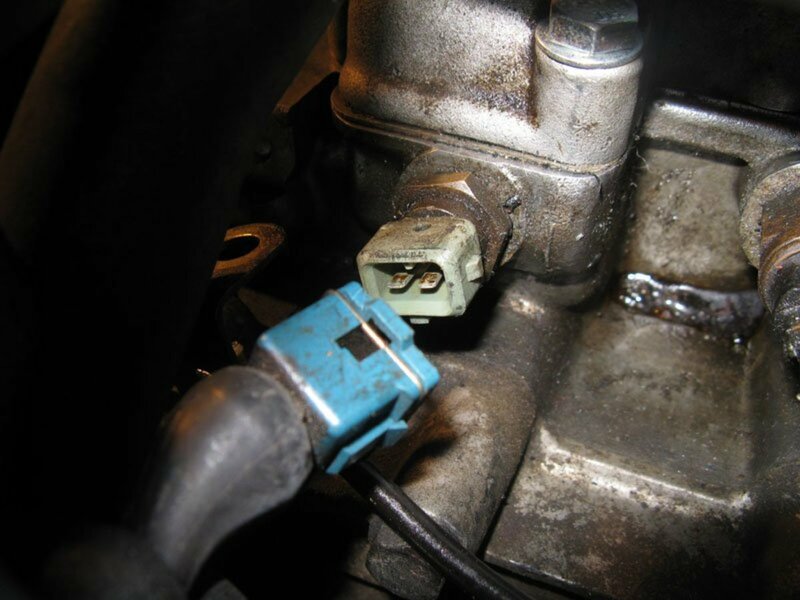 Unbolt the ABS sensor from the steering knuckle. Move the CV axle away from the work area by supporting it with a bungee cord. Remove the steering knuckle from the lower control arm by applying hammer blows to the place where the knuckle meets the ball joint. Remove the nut and bolt that fastens the rear control arm bushing to the car's subframe. The top nut must be held in place with a 19-mm open end wrench while the bottom bolt is being torqued off. Remove the two 19-mm bolts that fastens the front portion of the control arm to the car's subframe. Slide the control arm out of the subframe. Attach the new ball joint to the new control arm. If the new ball joint comes with a grease fitting, install the fitting. Transfer the spacer or washer from the old control arm to the new control arm. Wiggle the new control arm's rear bushing into the subframe control arm bracket. Align the holes and push through the connection bolt. Position the bolt's nut so that the bolt can thread into the nut. An open-end wrench must be used to hold the nut while the bolt is being tightened. Do not apply the final torque until the front of the control arm has been attached to the subframe. 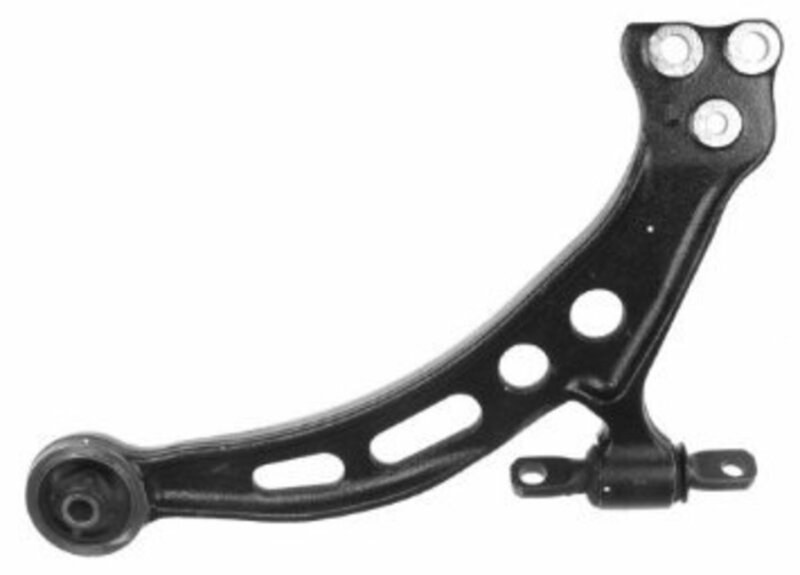 Attach the front portion of the control arm to the subframe. Move the control arm up and down while screwing in the bolt to avoid cross threading. Torque down the front and rear control arm bushing bolts. 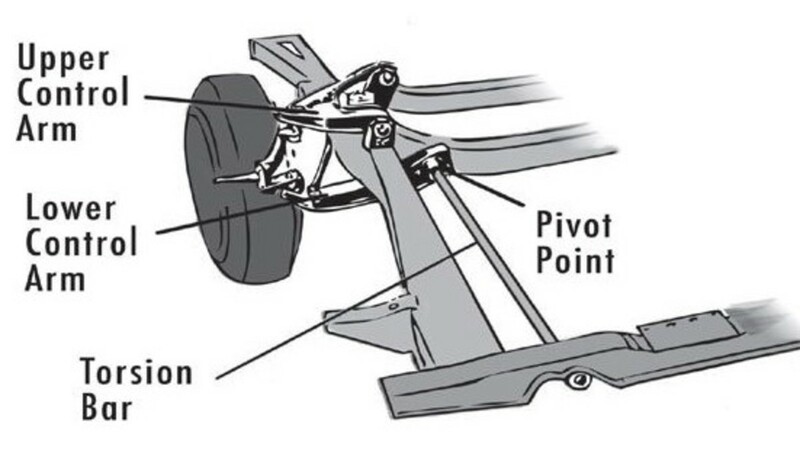 Mount the steering knuckle onto the ball joint shaft and secure the connection with the ball joint nut and cotter pin. Install the dust shield back onto the rear of the steering knuckle. Apply light hammer blows to press it in. Wiggle the CV axle shaft into the wheel hub. When the shaft's threads appear on the other side of the hub, screw on the axle shaft nut. Reattach the tie rod end, screw on the retention nut, and install the cotter pin. Align and push through the top strut mount studs through the holes in the chassis' strut tower. Screw on the strut stud nuts and torque them down. Push and wiggle in the steering knuckle's strut mounting point onto the suspension strut mounting point. Align the holes and push through the mounting bolts. Fasten the bolt's nuts and torque it down. Attach the ABS bracket to the chassis. Push in and bolt on the ABS sensor to the steering knuckle. Attach the brake line bracket and ABS bracket to the suspension strut. Attach and bolt on the sway bar / stabilizer bar link to the strut and sway / stabilizer bar. Mount the brake rotor onto the wheel hub and hold it in place with a lug nut. Install the brake pads onto the caliper bracketm then bolt on the caliper. Torque down the CV nut and install the cotter pin washer and cotter pin. If your new ball joint came with a grease fitting, inject grease into the ball joint.